Donut beads are round beads with a center hole that is large enough to accomodate a variety of jewelry making cords such as leather, hemp or ribbon. Donut beads are often drilled crosswise (through the donut) as well, so they can be used in a variety of ways. 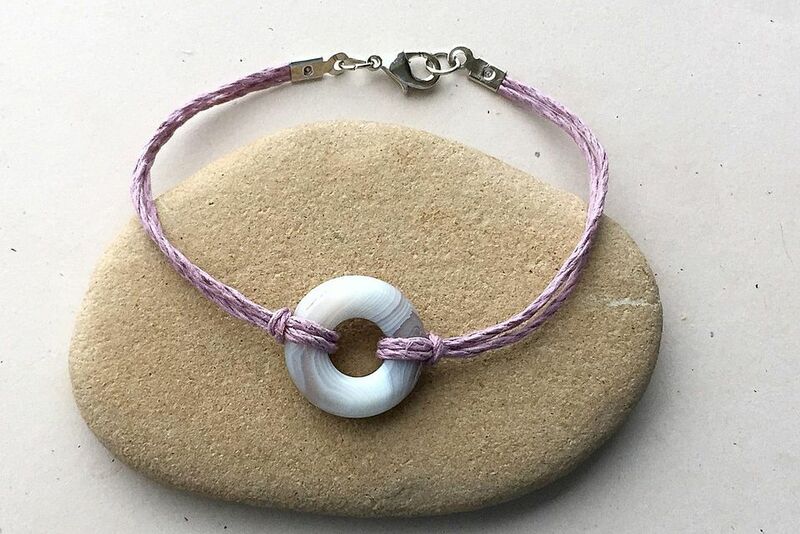 This project uses a donut bead focal and colored hemp cord to make an easy bracelet. One of the hidden features of a bracelet like this is that the cords can be removed and changed very easily if you want to the change the look of your bracelet. This project also uses fold over clasp ends, which are an easy way to end leather or braided cords and connect a clasp. To make a donut bead bracelet, you will need hemp, leather, waxed cotton cord or other similar materials. I am using hemp cord and an agate donut bead. In addition, to connect the clasp, I am using fold over cord ends, jump rings and a lobster claw clasp. For each side of the bracelet, cut a piece of hemp at least 7 inches long. Each side of the hemp will be folded in half, so it needs to be long enough to make one side of the bracelet. The hemp is connected to the donut bead with a lark's head knot, one of several types of knots used in beadwork. To make the lark's head knot, fold the cord in half and put the loop through the donut bead. Pull the ends through the center of the cord and pull tight. This will tie a lark's head knot around the donut bead. Repeat the same steps with another piece of cord. Cut a piece about 7 inches long, fold it in half and tie a lark's head knot. This will form the other side of the bracelet. Be sure that you make the lark's head knot the same way as you did on the other side. You want both knots to face the same way. This picture shows what I like as the front side of the bracelet. If you flip over the donut, this is what the lark's head knots look like on the other side. To me, this is the back side. Fold over cord ends make it easy to finish and add a clasp to cord ends. Trim the ends of the cord and line them up in the open fastener as shown in the picture. Using chain nose or flat nose pliers, fold over the first side of the fastener over the cord ends. Push securely down the entire length to make sure it is tight. Fold over the other side of the cord end to finish the first side. Repeat these steps on the other side of the bracelet. You can also add some glue inside before folding over the tabs. It isn't usually necessary, but if you are worried about the cord slipping out, it can give you extra assurance that the cord is held tight. Twist open the jump ring and add the clasp. Be sure to open the jump ring by twisting the two ends in opposite directions instead of pulling the ends apart. Your bracelet is finished and ready to wear. This same style works equally well with onnectors and charms. But there's still one more surprise with this bracelet! If the hemp bracelet begins to show signs of wear or you prefer a different color, it is easy to change the bracelet cord. Untie the lark's head knot by slipping the end through the loop. It will never come untied by itself, but you can easily untie it if you want. Make another bracelet cord in a different color following the instructions to add the fold over cord ends. Then add the new cord by slipping the loop through the center of the bead and tying a lark's head knot to secure it.